SEOs tend to work themselves into a frenzy over every minor news announcement that comes out of Mountain View–and one could probably say Local SEOs lie on the extreme end of the spectrum. In some respects, it's understandable. Our space is constantly evolving, and to ignore these announcements can put us at a significant disadvantage relative to peers who are paying closer attention. At the same time, this frenetic pace can lead to a bit of information overload, and an inability to see the bigger picture–both in terms of Google's algorithm itself, and more broadly in terms of where the company is headed as it tries to stay ahead of its many competitors. I focus exclusively these days on a very small niche of SEO–Google Places– and even in this tiny little sliver of the online marketing world, I've found myself struggling to keep up over the past several months. It seemed to me that Google's pace of major announcements, initiatives, interface updates, and (possibly) algorithmic changes had really kicked up several notches since about April of this year & I wanted to see whether I was just starting to lose my mind, or if that was really the case. 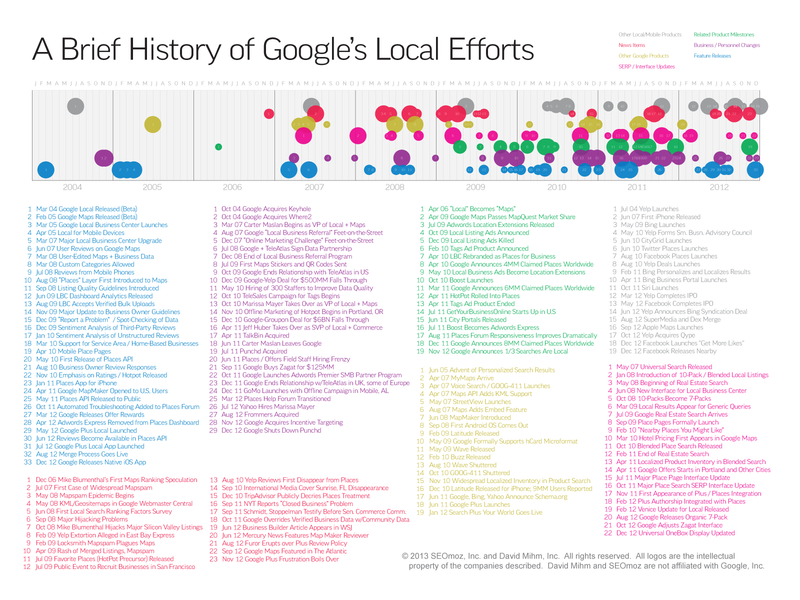 With the help of the amazing blog archives of Mike Blumenthal, Greg Sterling, Matt McGee, all three of those guys at Search Engine Land, and many, many others, I set out to review all of the major announcements and changes at Google Places since the inception of its ancestor, Google Local, back in 2004. After compiling what I felt were all significant announcements I attempted to categorize both the type of announcement, and the magnitude of their significance, in some cases with the benefit of hindsight. It's hard to take in all of this data at once, so I've made these infographics available for download in multiple formats, and included an interactive version below, which also serves as my "bibliography." What do you think? Did I miss any updates that you feel should be included? What insights, if any, does this visualization suggest? What do you think about the direction Google is headed? Contribute to the discussion over on the SEOmoz blog (preferred) or e-mail me at davidmihm@gmail.com with your feedback. Apr 06 "Local" Becomes "Maps"
Feb 10 "Nearby Places You Might Like"
Dec 12 Facebook Launches "Get More Likes"